There are certain aisles in the supermarket that I avoid going down because there’s just no point in tempting myself. I avoid the chocolate aisle, the crisps aisle, the cake aisle… therefore I don’t buy chocolate, crisps or cake. This method works fantastically and I feel incredibly virtuous and good about myself while I’m bagging up all of my healthy purchases, and then an hour later when I’m sitting at home craving a bag of crisps (potato chips to you Amurricans) I start to hate myself a little bit for being so silly. People, I have found a solution! Make crisps yourself! In the microwave! This way, you get to feel good and virtuous at the supermarket, and you still get to eat all the crisps. It’s win win! (and if anyone has the urge to correct me on this obviously flawed logic… shush please). 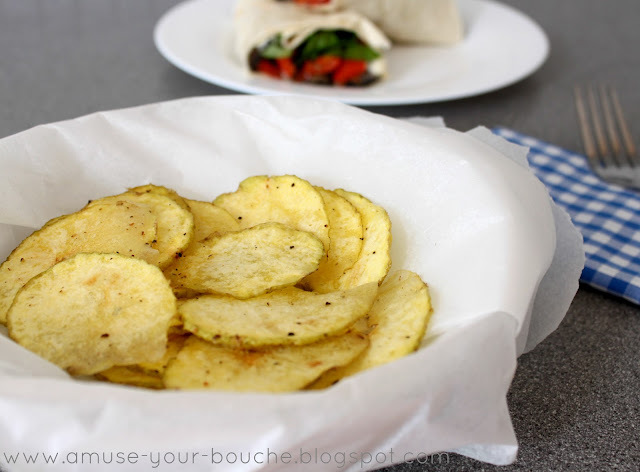 These crisps are easy to make, but they can take anything up to about 10 minutes in the microwave per portion, so while they’re totally worth making to curb a craving, I definitely wouldn’t recommend making them for a crowd – if you were serving 20 people at a party, you’d be hovering around the microwave for hours – not quite worth it. These crisps are good, but they’re not that good. 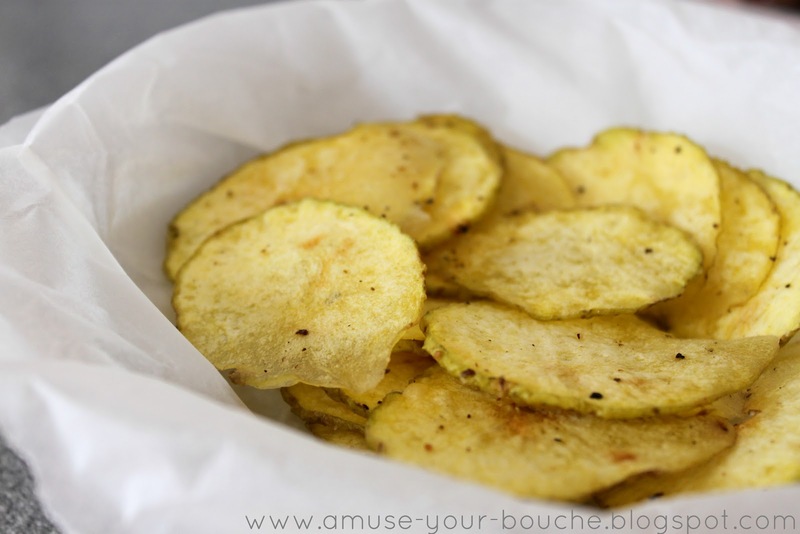 I made simple salt and pepper flavour crisps, but you could play around a bit with different spices and seasonings – let me know if you come up with any wonderful creations! One of the reasons I wanted to get a mandoline earlier this year was so I could make my own crisps. If you don’t have one, you can still make these, but you’ll just have to take the time to make sure you’re cutting your potato slices as thin as you can. I wanted to wait until I had a mandoline before giving these a go because I thought I’d be less likely to injure myself (turns out I injure myself anyway). If you want the recipe for the wrap that you can see in the background of these photos, you’ll have to wait until my next post. Suffice to say, I practically inhaled it, so you’re going to want to come back for that one. ETA: See the recipe for the portobello and red pepper wrap with roasted garlic mayonnaise here. 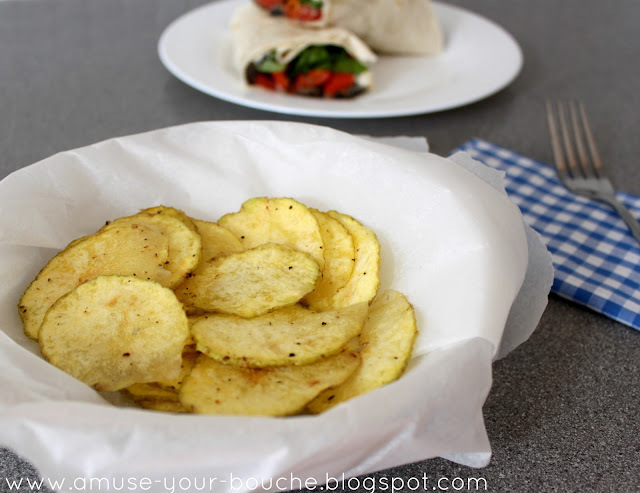 Cut the potato into very thin slices – use a mandoline if you have one. Place the slices into a bowl of cold water and leave to soak for 5 minutes. Drain, and then rinse once more with cold water. Pat the potato slices dry with a towel, and place into a large bowl. Pour over the olive oil, and season generously with salt and black pepper. Use your hands to toss the potato slices in the oil, ensuring that each slice is coated in the oil and seasonings. Lay the potato slices in a single layer on a microwave-safe plate (I had to do mine in 2 batches, one batch at a time). Cook on full power in the microwave for 3 minutes, then turn them over (careful – they’ll be hot!). Cook for two more minutes. If your crisps are not yet done, cook in bursts of 30 seconds until they are ready, removing any that are cooked as you go along (thinner slices don’t take quite as long). In my 800w microwave, mine ended up taking 7 1/2 – 8 minutes in total. You’ll know they are ready when golden brown spots are beginning to appear, and they are becoming firm and crispy. They will crisp up further as they cool. When the crisps are ready, remove them from the microwave and transfer to a rack to cool. Repeat in batches until all the potato slices have been used. Using a spicey mix works well – I just made some sweet potato crisps with Togorashi seasoning and salt using the microwave method. I would show pics, but… there is nothing left to show! I can’t believe this! This is awesome for when the kids need emergency snack! Will have to try this with the basket of potatoes I have under the sink! Man….these look awesome and thank you for posting on the weekend! wow this looks so fun and really good!